Finally! Rings with some personality. 1. 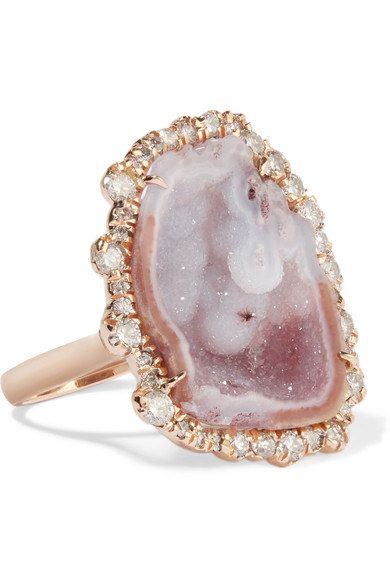 This ethereal, rose gold-plated ring with raw quartz perfect for stacking. Get it from The Fox and Stone on Etsy for $249.99 (available in sizes 4–11 and four finishes). 2. This silver, moonstone ring that will have you over the moon. Get it from Azalea for $200 (available in sizes 6 or 7). 3. This 14k rose gold ring with a tear-drop moonstone and matching diamond stacking ring that will bring on some real tears. Get it from HelloRing on Etsy for $649+ (available in sizes 3–10 and six finishes). 4. This gold-plated daisy ring for people who have been plucking a lot of petals off flowers. Get it from Vancaro for $165 (available in sizes 5–10). 5. 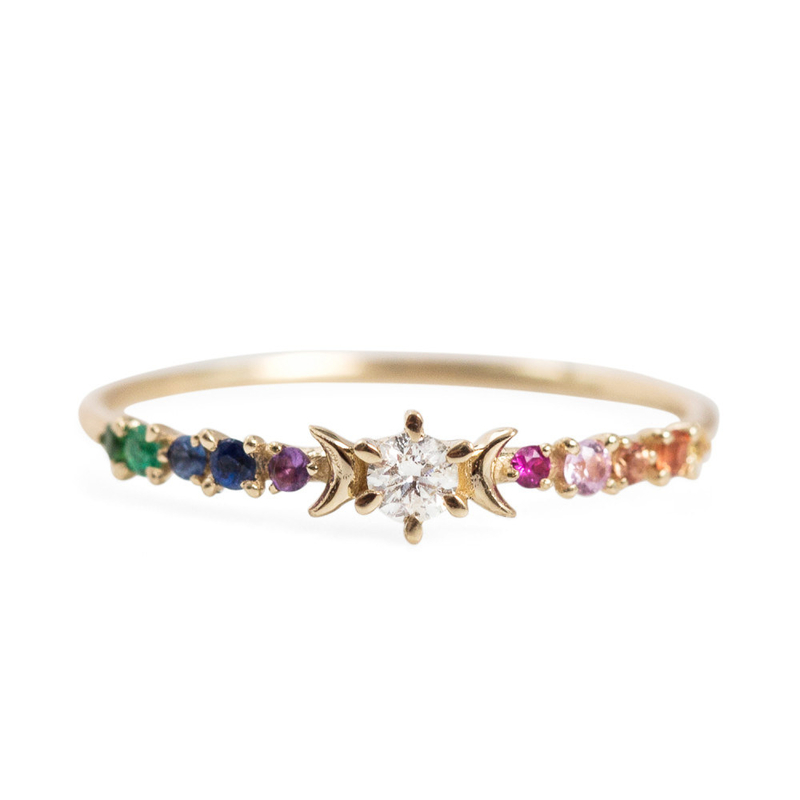 This 14k gold band dotted with a spectrum of different gems (for instance, an emerald, sapphire, amethyst, and ruby). 6. This colorful moonstone ring set in oxidized sterling silver that changes colors as the light hits it, so it's like you're wearing a different ring every day. Get it from Amazon for $105 (available in sizes 5–10). 7. This bold stacking ring set with a raven cuddling a stone to symbolize protection and assistance. Get it from GeshaR on Etsy for $450+ (available in sizes 4–13 and 22 stones). 8. 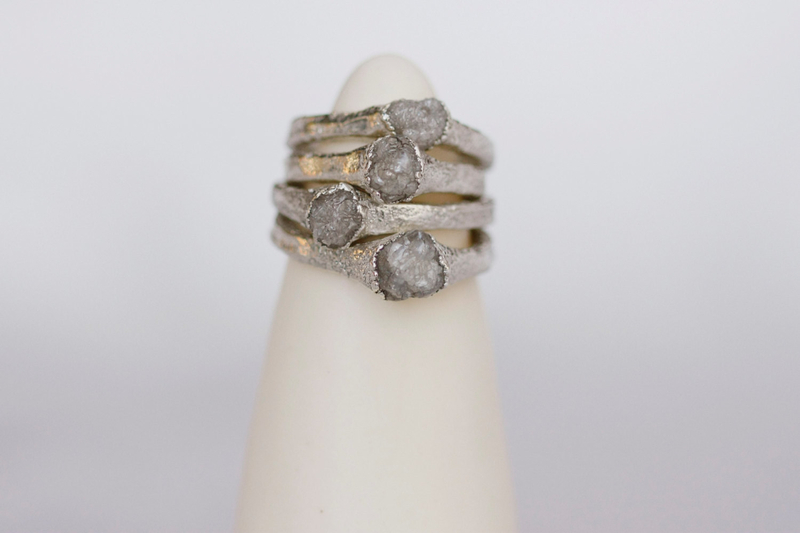 This grey crystal ring that's a little rough around the edges, because no relationship is completely perfect. Get it from littlesycamorebride on Etsy for $650. 9. This 18k gold ring with a black diamond and 22 tiny, conflict-free diamonds to symbolize taking on harder challenges in your relationship — and on the ski slope. Get it from Catbird for $2,050+ (available in sizes 4–8 and two finishes). 10. This intricate ruby and diamond ring for couples with a lot going on. Get it from TresorsDuJour on Etsy for $3,746.59+ (available in sizes 3–16 and four colors). 11. This delicate lattice of flowering branches to celebrate the budding new chapter in your relationship. Get it from Catbird for $1,980+ (available in sizes 4–7). 12. This 14k gold-plated ring with a blue sapphire cradled in detailed leaves and branches for the nature-loving couple. Get it from TheManerovs on Etsy for $645.48 (available in sizes 4–10 and two colors). 13. This adorable cat-eared ring with black zirconia for the purrfect engagement pictures. Get it from MySacrum on Etsy for $104.93. 14. 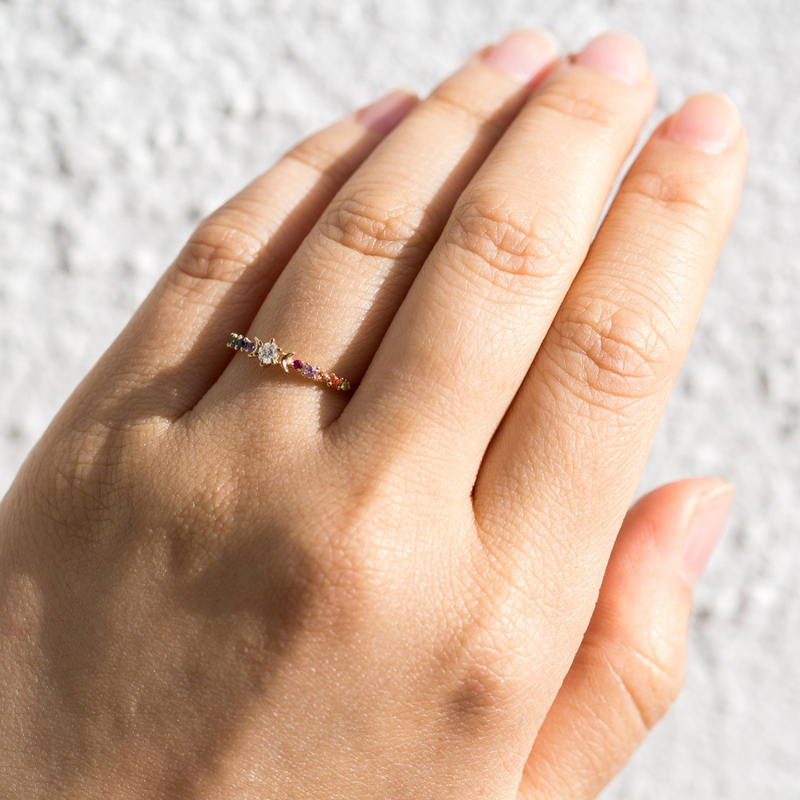 This glittering topaz ring that's so easy to get lost in, you might forget to actually say yes. Get it from godjewelry on Etsy for $99 (available in sizes 3–11). 15. This 14k gold ring with tiny diamonds embedded in blue enamel for adding a drop of sunshine to your life. Get it on Of a Kind for $1,700 (available in sizes 4.5–9). 16. 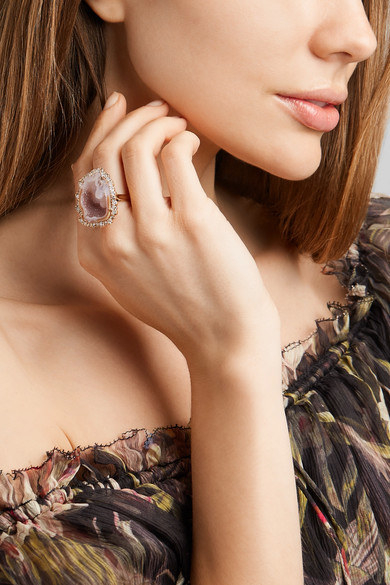 This gorgeous pink geode ring surrounded in 18k rose gold and 2.37 carats of tiny, irregular diamonds for a truly unique piece. Get it from Net-a-Porter for $13,050 (available in size 7). 17. This white gold ring with a pink sapphire that's adorably off-kilter, just like you. Get it from Sarah Hood Jewelry on Amazon for $495. 18. This 14k rose gold ring set featuring a rutililated quartz surrounded by champagne diamonds worth toasting. Get it from Anna Sheffield for $2,100 (available in sizes 3–13). 19. This 18k gold heart ring dusted with pavé white diamonds for showing off your love every day. Get it from Barneys for $2,225 (available in size 7). 20. This stacked, rose gold ring that proves that three stones are better than one. Get it from Neiman Marcus for $850. 21. This elegant rose gold halo ring with conflict-free diamonds for feeling like an angel every day. Get it from ShopClementine on Etsy for $1,650 (available in sizes 4–9). 22. This double-decker ring that's pretty much a crown for your finger. Get it from willwork for $789+ (available in sizes 3–9 and three finishes). 23. This nautical ring, with a rope-like band and sea-like, cuprian tourmaline stone, for a marriage as vast and endless as the ocean. Get it from Trumpet & Horn for $9,500. 24. This mossy diamond slice ring for people who are unimpressed with perfectly cut diamonds. Get it from charlieandmarcelle on Etsy for $895 (available in sizes 4–9.5). 25. This 14k gold and diamond ring with a moonstone center for a more realistic version of lassoing the moon and giving it to your significant other. Get it from Luna Skye for $1,885 (available in sizes 4–8.5 and three finishes). 26. This white and yellow gold ring for a love that rivals Link and Zelda. Get it from SapphireDesignStudio on Etsy for $523.34+ (available in sizes 4–11 and 10 finishes). 27. 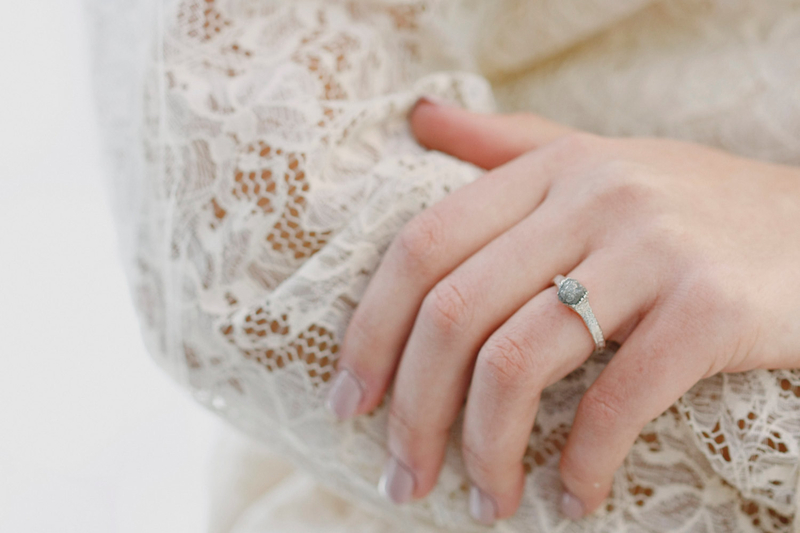 This spooky, silver-plated moonstone that Casper the Ghost might use to propose. Get it from ButterflyShop on Amazon for $25. 28. 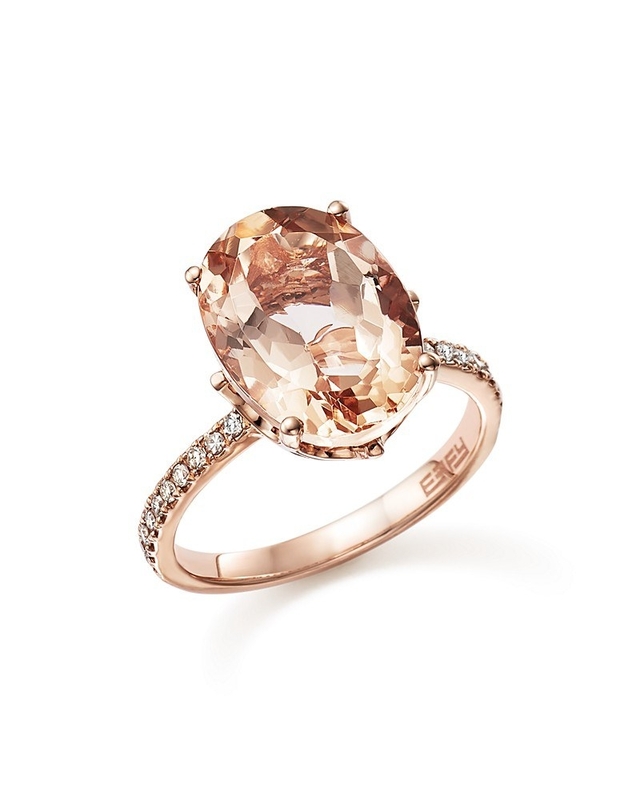 This rose gold ring with a matching rose diamond for people who want to take the next step with millennial pink. Get it from Bloomingdale's for $1,700 (available in size 7). 29. This mother of pearl lollipop ring that's just the eye candy your finger needs. Get it from Spring for $695 (available in size 7). 30. This raw opal and dioptase ring with three bands that will have you running to the altar. Get it from HandcraftedGemsShop on Etsy for $225+ (available in any size and four finishes). 31. This diamond and sapphire cluster ring that's handmade, making each one as unique as your relationship. Get it from Bario Neal for $2,837 (available in sizes 4.5–7.5 and eight finishes).